Years ago I worked during International Quilt Market. It was the year that Hurricane Sandy hit the Easy Coast and many of the attendees in Houston were kept there since flights being cancelled. It was during that time at Market I had the opportunity to meet and get to know John Kubiniec from Big Rig Quilting. John is an incredibly nice person! We visited the Museum of Art in Houston and we were also fortunate enough to visit the Rothko Chapel. John is musical, loves good food and LOVES to make people laugh. I am very lucky to have him as a friend. I am also thrilled to be part of this blog hop to promote his new book with C&T Publishing, A New Spin on Drunkard's Path. You can find this book available through the C&T Publishing site here or also through Amazon. 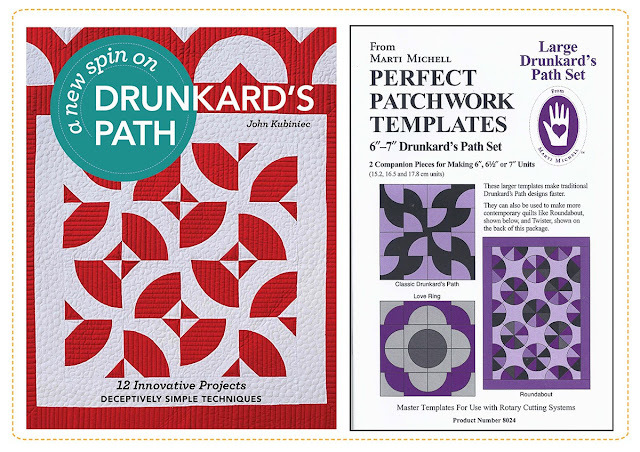 John's book includes everything you need to know on how to successfully make 12 amazing quilts using the traditional Drunkard's Path. 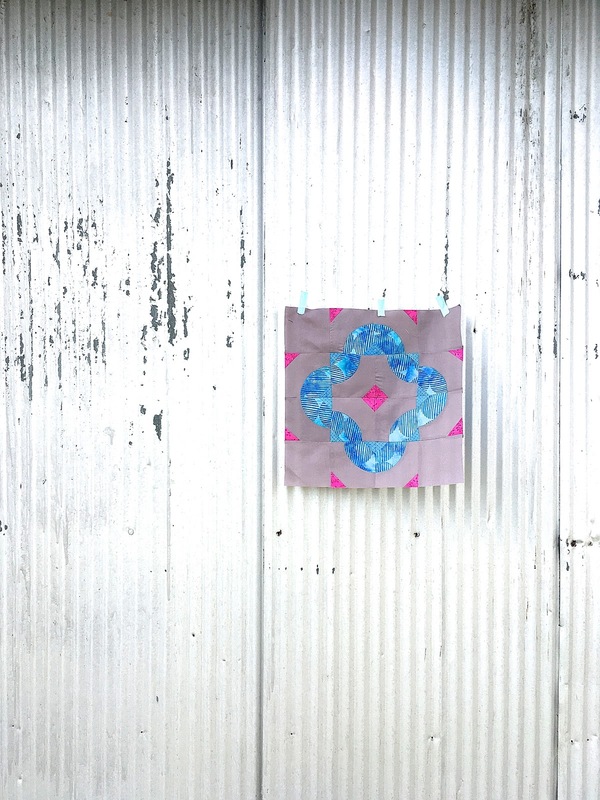 The book includes templates for the quilts but you can also use acrylic templates made by Marti Michell or die cut templates. 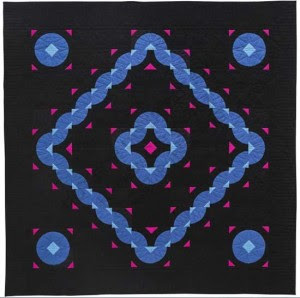 I was looking through all of the wonderful quilts for inspiration and Nightfall caught my eye. I did not make the full quilt. I made the center section to make a cushion cover for my daughter. 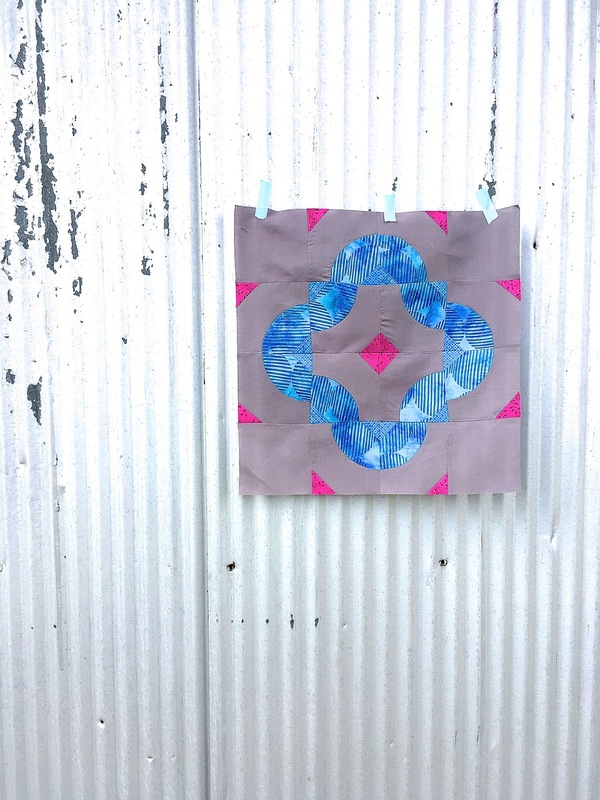 I love this block and can see making an entire quilt with these colors! I priced my block using Aurifil 50 wt. When sewing curves, it is the best thread to use because there is no bulk, giving you more precise curves! If you are new to curves and are not sure if you are ready to commit to an entire quilt, try a cushion cover! It is the perfect way to try something new without felling overwhelmed by the thought of a full quilt! I dove into my stash to find the perfect fabric for my very picky daughter and I found this one by Island Batik. She ADORES batiks! Katy is quite thrilled by the look of what will be her new cushion cover! She says this looks like a swimming pool, it is perfect for her! You can see how I used only the center of the full quilt. Here is the full Nightfall quilt! Stunning! When making any Drunkard's Path blocks I use pins! Lots and lots and well...LOTS of pins! I admire the wonderful quilters that can use three pins and GO for IT! I am not that quilter, lol! Other than this curved project, I have only made one project using a Drunkard's Path many years ago. It was a Christmas Tree Skirt. It was super fun and even had rid rack ( very vintage looking). You can see the tutorial from 2011 here. Here are two other quilts in the book I am kinda GA-GA over! Now for an exciting giveaway!!!!! This very generous giveaway includes a copy of John's new book AND an acrylic template set from Marti Michell! For a chance to win this prize package please enter using Rafflecopter. You are not required to do all of the options for a chance to win but it will increase your chances of winning :o) A random winner will be chosen on Oct 11. Thank you so much and good luck! And if you have not yet, go and visit all of the other exciting bloggers ( they are doing the giveaway too!) and see what projects they have been making! I piece and have done appliqué. Paper piecing scares me. Drunkards path has lots of design options, it would be fun to try. Thanks for the giveaway. Love the cushion cover! I am pretty much a piecer, but applique once in a while. Curved piecing is something I really want to practice! The only technique that is not my favorite is applique. Curved piecing is something on my bucket list of quilts I want to make, but I haven't taken that step yet. Sure hope I can add it to my favorite list soon. I have worked with all 3 techniques, but my favorite is piecing. I enjoy sewing all those shapes together to make something beautiful and unique! I've even sewn a table runner using the Drunkard's Path template and would love to have more practice and inspiration from this book! 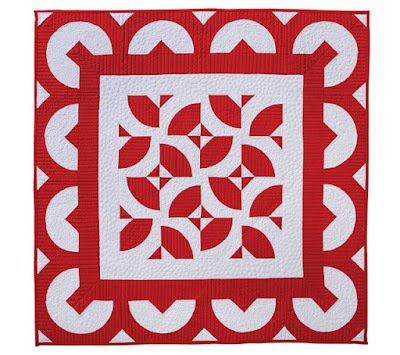 I love the border on the red and white quilt. I'm a piecer although I've done paper piecing and appliqué. Great giveaway!! 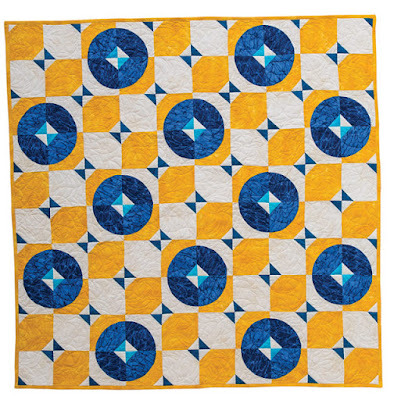 I love the same quilts you highlighted! I recently took a class from Latifah Saafir, and I'm now doing curves with 1 or no pins! It was a great class and I highly recommend it. Love your pillow top ... and thank you for the giveaway! I enjoy piecing most. And I am slowly learning to enjoy quilting too. Love the red and white quilt! Piecing is easy, even curves, but I love applique. I was afraid of that "A" word, until I tried it - it was love at first needle turn. And yes I even made a 20 block Baltimore style quilt, all 3900 pieces by hand! I've been looking at this book myself - I love your block! have never tried to piece curves. I love your cushion cover and I really love your tree skirt! I am a piecer, but I enjoy paper piecing. I've done a bit of applique, but the fusible stuff. The hand-turn stuff I had to undo; I've just not practiced enough for it to look remotely good. That's okay because I like raw-edge and fusible! Love to hand applique. It is so relaxing. I would call myself piecer, with applique ranking next. I like traditional piecing best. I have lots of batiks to go with this prize I hope to win. I really like this book. Mostly I am a piecer. I just finished paper piecing a Twisted Log Cabin. So glad it is done. Not my favorite thing to do. I do love those colors. Piecing is my favorite part of the whole process. I definitely prefer piecing quilts. Something about the geometry that goes into them. Love piecing - but lately I am really getting into applique! I do all three but my favorite is piecing. I like applique almost as much with paper piecing coming in last. I like traditional quilting, both by hand and by machine. I'm a little afraid of curved piecing, so I haven't done that (yet). I would love to win a copy of the book so I can give it a try. I love to applique and I love to piece, but I hate to paper piece. Thank you for the chance to win. MY favorite way is piecing, but I do some applique--never comes out so nice, and I did a paper piecing quilt along that I was pretty happy with! Thanks for the chance to win! I truly love the block you created. Fun design and yummy colors. I definitely think you need to make it into quilt. 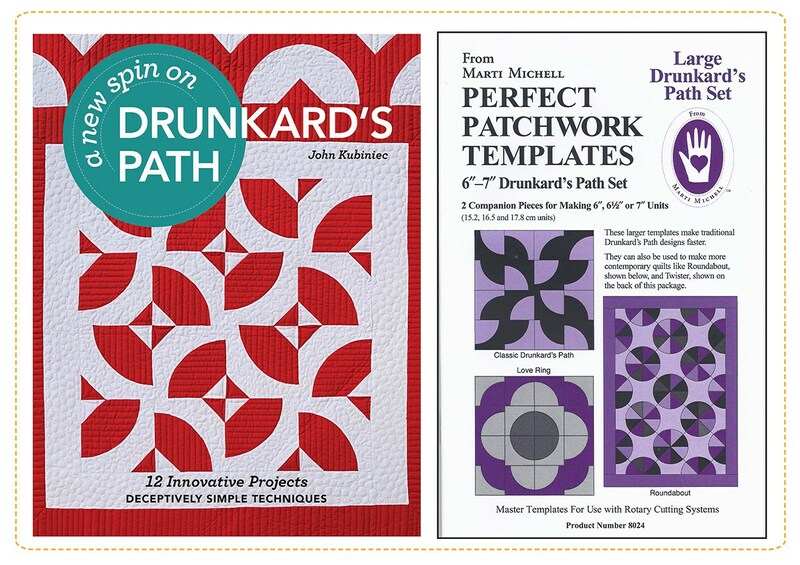 I've made quite a few drunkard's path quilts, but like the unique style this book offers. I posted then read the question. All of the above but applique is my first love. I enjoy piecing quilts the most. I enjoy all of these with the exception of applique. I don't know why I don't like it since I really enjoy hand sewing. English paper piecing may be the most fun and least stressful. I love paper piecing and machine piecing! I am trying to learn machine quilting but it is a challenge! I like to piece, but I enjoy working with applique and paper piecing on smaller projects. I mostly piece and appliqué. I'm posting a comment here because rafflecopter won't let me post a comment - spent 15 minutes trying, and gave up. I like piecing, foundation piecing, and applique. Here's my email address in case this comment actually counts anyway. I really want to win these! Thanks for the chance. I am mostly doing piecing...tho have tried some Hand Applique (was very slow at it..lol) Also have done some raw-edge machine applique. Your Nightfall is lovely! Great colors! I love piecing and applique. I'd love to try John's 3 pin method. I like improvisational piecing, but I'm intrigued by the patterns in this book. have been thinking I will try a drunkards path block for ages and seeing yours have awakened that thought, just a cushion to start with not a quilt! I love doing hand applique. Doing curves, especially Drunkard's Path, is on my bucket list of techniques to learn. I am mainly a piecer. I have not done much curved piecing, but this book has inspired me to start improving my skills! I am a three pins person for curves. I am one of those strange people who find them fairly easy. I think it has to do with a foundation in garment sewing and tailoring. I work at a community drug abuse prevention coalition, and I want to make a raffle quilt based on the drunkards path and call it the right path. I have had my eye on this book and would love to win it and the templates. I am a piecer, but I also love applique! I enjoy piecing & paper piecing the most, but I also enjoy doing some applique. I love to piece. It's so satisfying to see the pieces float through the machine. Piecing is my favorite but I enjoy paper piecing and machine applique as well! I mostly piece, but also do applique, paper piecing and wool work. I especially love applique. Thanks! I guess I'm a piecer, but I'm open to learning new techniques. Those curves are lovely! I am a paper piecing fan-most definitely! Machine piecing is my favorite technique. It's like putting together a jigsaw puzzle. While paper piecing can be more accurate, it's also more aggravating. So I usually stick with the regular kind. I am a regular piecer, but I am trying to branch out. I have made quilts with curves, however! Regular old machine piecing is my thing. Have never done a quilt with curves, even tho a Drunkards Path has been on my bucket list for years. I enjoy the variety of all the techniques. I love to piece. I find the process of sewing many, many quarter inch seams very soothing. Thanks for sharing your pillow project. Love the colors. I am happy with piecing but also with machine appliqué. 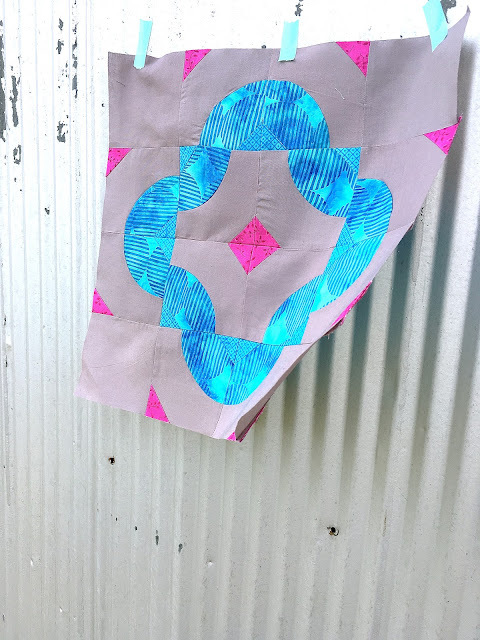 Love your pillow top - beautiful blue batik! I enjoy machine piecing and applique. Love the look of curved piecing but have been quite intimidated by it. This book would surely help calm my fears! I piece my quilts by machine. Thanks for the giveaway! I love your cushion cover! I am mostly a piecer. Love the block you made. It makes the book look so doable. I like to hand applique because it reminds me of my mom. I enjoy piecing and applique. No much of a foundation paper piecer. I love it all. I'm working on a machine applique project, with multiple layers, and some EPP, but mostly enjoy piecing. I also have something with foundation piecing I need to finish. Thanks for the recommendation on the book. The top you made is really pretty. I'm good with all of the methods! I primarily piece my quilts, but I love paper piecing also! I am not a pinless quilter, either. I need pins for everything. I do it all. I just finished "My Small World" by Jen Kingwell. I used machine piecing, machine applique, paper foundation piecing, English paper piecing, and hand embroidery. It was a challenge but worth it! I am definitely a foundation paper piecer!! My traditional block making always end up wonky. I also ADORE improv becuase precise doesn't matter so much!!!! I am just le4arning quilting learning Pat Sloan's Secret Garden so I guess it is piecing. I'm a newbie, so I don't have a favorite yet. I'm still in the experimenting stage, and this book looks perfect! I definitely feel more comfortable piecing my quilts. I have tried paper piecing and applique, but those techniques are more challenging for me. I enjoy piecing. I also enjoy watching texture begin to appear from free motion quilting. I love all the new drunkard's path ideas. Thanks for sharing. My favorite is piecing. Beautiful.